If there's one thing I love doing on this blog, it's putting new authors on your radar! There's so many tantalizing books out there, just waiting for you to discover them. I'd like to help that along. So, let's get started with today's book spotlight, shall we? Hold on to your fairy tale hats, my friends! Today's author is bringing out a new take on a story you know and love. Please give a warm welcome to Lacey Louwagie, author of Rumpled. A child for a powerful sorcerer . . .
Rumpelstiltskin can change anything he touches into gold, but he cannot change his own twisted body. The sorcerer Laurus can make Rumpelstiltskin tall, strong, and handsome—but he will only work his magic in exchange for a child in its first year of life. When Emily’s deluded father claims she can spin straw into gold, the King demands proof. Caught between a mad father and a mad king, Emily’s life hangs in the balance. Rumpelstiltskin will help keep up her ruse for three nights—if she promises him her firstborn child. When the King decides to marry Emily, the pretense must continue for much longer. And what Emily offers Rumpelstiltskin in return for his continued help has the power to change everything. This retelling of “Rumpelstiltskin” is best suited for ages 14 and up. I don't know about you, but fairy tale retellings are one of my favorite things in this bookish world. There's something about seeing a story I already adore, brought to life in a new way, that makes me smile. I'll stop talking and let Lacey take the stage now though. Enjoy her guest post below, and make sure to read the bottom for a special surprise! I have an ongoing joke with my friends from college in which we bargain or bet away our firstborn children over trivial matters. We're all in our thirties now, and none of us have children yet. This might shed some light onto why. Although I initially planned to write something totally from scratch, when I started to brainstorm I thought about the many stories that are already part of our cultural consciousness that involve the bargaining of a firstborn child. Of all these stories, “Rumpelstiltskin” has always fascinated me. It's fraught with moral ambiguities: Who is the villain—the girl who tries to break her bargain, or the dwarf who demands an unreasonable price for his help? Is it meant to teach us that it's OK to break your promises if you made an unwise bargain, or if you are beautiful and the opposing party is ugly? The motives are also mysterious. Why does Rumpelstiltskin want a child? And why does he give the Queen an “out” after the child is born—is it compassion, or pride? So along with my husband's initial question, my mind buzzed with these questions as well. So for about three years, I used “Rumpelstiltskin” as the framework around which I could imagine some—not at all definitive—answers. I knew when “Rumpled” was done that it was at an awkward length to submit to traditional publishers—at about 26,000 words, it fell far short of the 50,000+-word novel length most publishers prefer, while it was also about 15,000 words too long for even the most generous short-story market. It seemed just the right length to fill a three-hour plane flight, though, so I decided to publish it as an ebook. If you love old stories with new skins the way I do, I hope you'll give it a try. To that end, I'm offering free downloads on March 19th and 20th. The paperback version is also available at Amazon.com. Thank you so much Lacey! Did you hear that bookworms? A free book! Snag your copy of Rumpled starting now, and until the end of the March 20th. Coming to this post too late to participate in the promotion? No problem! Here's a few giveaways that stay open longer. 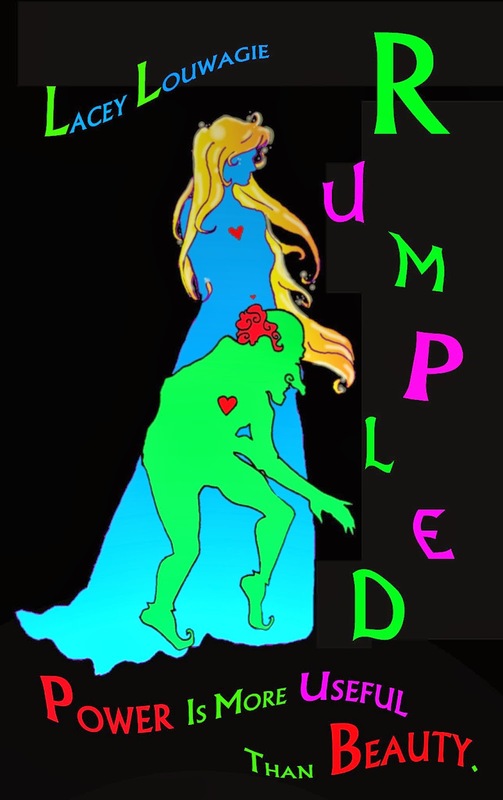 Make sure to add Rumpled to your reading list!